Take Me With You When You Go - framed by Todd White // £1,645.00. We get another glance into the cheeky imagination of one of your favourite figurative artists, none other than Todd White. In ‘Take Me With You When You Go’ a blonde lady who seems squeezed into a beautifully designed, figure hugging cocktail dress, which she seems bursting out of! I love Todd's generous use of multi-colour all over the canvas, starting with the array of objects adorning the top arch of the painting - I wonder what he is representing with those splurges of colour and surreal shapes? Looking at this other recent work its usually adornments to the women’s hair or flowers; maybe they are thought bubbles or simply there to exercise Todd's colour palette? The patterns carefully crafted onto the lower portion of the dress and the colour matching eye makeup of the lady, add to the visual appeal of this 'feel good' limited edition. 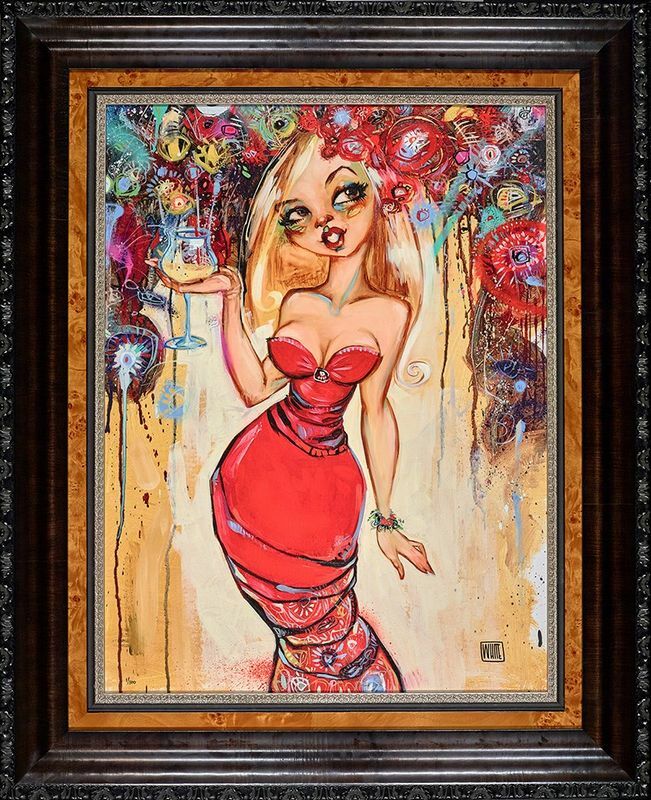 For 2019, Todd White seems to be experimenting using pallet knives and acrylic and the effect on his original art & the subsequent hand embellished limited edition canvases, seems to really bring the art to life!